The Farmhouse Obsession: Reviewing a Buckwheat Saison! This will be a brew review. I will pepper these in every now and then. I'll keep most to homebrew but if a commercial example stands out I may put that on here as well. This one was sent to me by a fellow farmhouse officionado, Amos from Browne and Bitter blog. His blog is on my list of frequently visited sites and you can check it out here. Popped this one in my brewery/garage while looking over some of my beers. 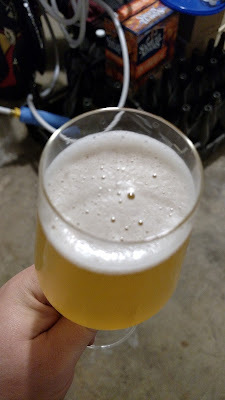 This is a saison he brewed with buckwheat in the grist and then blended with a pale sour. Amos has been working with buckwheat for a few brews. He has some great write ups about it you can check out on his blog. This one in particular is one that started me down the path of brewing with this crazy seed. You can check out his most recent post on brewing and more with buckwheat here. All of his blog has some great info about all kinds of brewing and even more! Appearance: Pale straw in color and a little hazy. Love the hazy look. 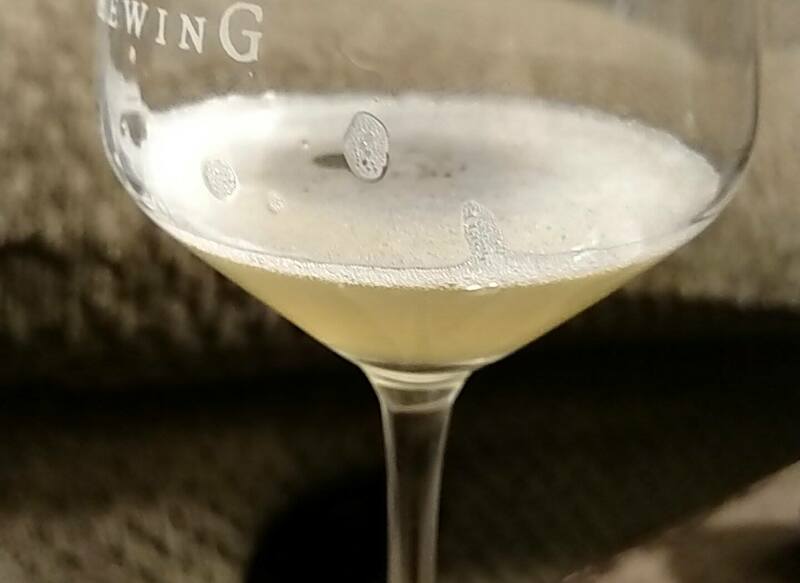 Soft white head full of tiny bubbles that when poured, stood about two almost two and a half fingers tall. Pretty great retention as well. It stuck around for a while and when it finally settles it kept a cap on the brew with small holes forming as your drank but then closed back up. Carbonation streamed up the glass the entire time I drank it. Brew system in the background. Aroma: First sniff I get a lemon/lactic tartness and then a soft pineapple. A little bit of grain and definitely some barnyard funk. Not a goat-y funk from caprylic acid though. I was wanting to see if that showed up from the buckwheat and it doesn't. There isn't anything offensive about this nose. It's pretty fantastic actually! When it warmed it had a green banana and citrus soda aroma. Lemon-lime type thing with the acidity mixed in. Really great and complex nose. Flavor: Right at the front of the mouth you get pineapple and a lemony tartness. As you swallow the tart lemon follows through the back of the throat. There is an underlying acidic note that I can't place. I'm getting this out of my saison I brewed with buckwheat as well. It's not unpleasant at all. It accentuates the lactic acidity nicely. There is just a hint of sweetness that seems to be like a grain or fruit sweetness. Not cloying at all. Adds in the complexity of the beer. As it warms a almost honey like flavor comes out. Still has the pineapple but more of the green banana in the flavor like the nose when it warmed. A lemon grass type flavor and aroma come out as well. I noticed more of the grassy type note as I swirled my last glass to drive out some carbonation. Mouthfeel: The carbonation was perfect to me. This is what I want in my beers. It was prickly on the tongue but not filled with carbonic acid that it altered the flavors. Medium to medium-light in mouthfeel. Super easy to drink and refreshing. 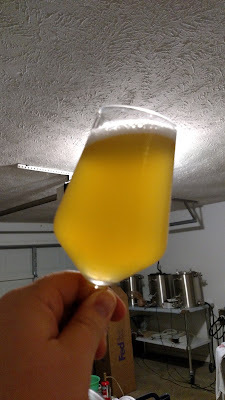 Overall: This is exactly what I envisioned a buckwheat saison to be. It has some flavor and aroma notes that you don't get from just using normal brewing grains. 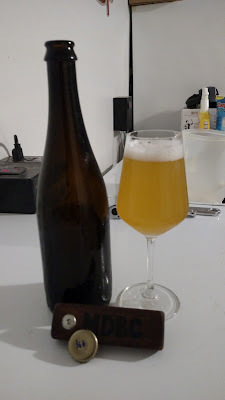 Amos's technique of blending the pale sour beer in with the saison works perfectly. I think both beers made there presence known without losing what the beer was intended to be. The soft lactic acidity and a bit of funk from the sour beer blended with the saison base really well. I was still able to tell it was a saison. I'd drink this beer over a ton of commercial examples I've had. This would also be a PERFECT summer beer. Amos wasn't positive on the ABV but he suggested around 5-6% and I think it drank closer to a 4% beer. Thanks again to Amos for sending it out for me to try. I've got a couple others from him and I'll be sending a return box for him to sample. I look forward to more exchanges in the future! Parting shot of the beer as I neared the end of the first glass. The head stuck around the entire time. Any movement stirred the carbonation up and brought it right back!